Forsythia is the genus and common name for a taxon of deciduous shrubs in the flowering plant family Oleaceae (olive family), popularly cultivated for their early-blooming, bell-shaped, yellow flowers, which typically open before the leaves appear. Forsythia comprise a small genus of about 11 species, mostly native to eastern Asia, but one native to southeastern Europe. However, there also are a number of hybrids and cultivars, many of which are popular ornamental plants. The beautiful yellow flowers of forsythia not only serve the plant's individual need of reproduction, but also fulfill a valued function for the ecosystem and for humans. Ecologically, the flowers provide an early spring food source for pollinating insects, while the plant is itself food for various insects, such as Lepidoptera larvae. 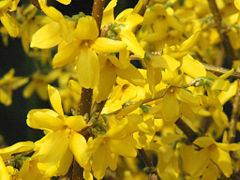 For humans, forsythia flowers are prized for their intrinsic beauty that brightens the spring season. The plant family to which forsythia belong, Oleaceae, or the olive family, comprises around 24 extant genera and around 600 species of mesophytic shrubs, trees, and occasionally vines. As shrubs, members of this family may be twine climbers, or scramblers. The family is characterized by opposite leaves that may be simple or compound (either pinnate or ternate), without stipule. Alternate or whorled arrangements are rarely observed. The lamina are pinnately-veined and can be serrate, dentate, or entire at the margin. The leaves may be either deciduous or evergreen, with evergreen species predominating in warm temperate and tropical regions, and deciduous species predominating in colder regions. The flowers of Oleaceae species are most often bisexual and actinomorphic, occurring in panicles or racemes and often fragrant. The calyx, which may or may not be present, and the corolla are synsepalous and four-lobed. The androecium has two stamens inserted in the perigynous zone and alternate with the lobes. The stigmas are two-lobed. The gynoecium consists of a compound pistil with two carpels. The ovary is superior with two locules, each bearing two axillary ovules. Sometimes the base of the ovary is circled by a nectary disk. The plants are most often hermaphrodite but sometimes polygamomonoecious. Forsythia is the common name for any of the deciduous shrubs comprising the genus Forsythia. These plants typically grow to a height of one to three meters (three to nine feet), and rarely up to six meters (18 feet), with rough gray-brown bark. The leaves are opposite, usually simple but sometimes trifoliate with a basal pair of small leaflets, and range from two to ten centimeters (one to four inches) in length and, rarely, up to 15 centimeters (six inches). The margin is serrated or entire (FOC; Huxley 1992). The flowers generally are produced in the early spring, before the leaves. They are bright yellow with a deeply four-lobed corolla, with the petals joined only at the base. They are insect pollinated. The fruit is a dry capsule, containing several winged seeds (FOC; Huxley 1992). Forsythia is named after William Forsyth (1737-1804), who in 1804, was one of the founders of the Horticultural Society of London, which is now known as the Royal Horticultural Society. Prior to this, William Forsyth served as a gardener to King George II at Kensignton and St. Jame's Places, after serving as gardener to the Duke of northumberland at Syon House and Curator of Chelsea Physic Garden (Mitchell 2001). Forsythia are commonly placed into the following eleven species (Huxley, 1992). Forsythia europaea Degen & Bald. Balkans in Albania and Kosovo. Forsythia giraldiana Lingelsh. Northwest China. Forsythia likiangensis Ching & Feng ex P.Y.Bai. Southwest China. Forsythia mandschurica Uyeki. Northeast China. Forsythia mira M.C.Chang. North central China. Forsythia nakaii (Uyeki) T.B.Lee. Korea. Forsythia suspensa (Thunb.) Vahl. Eastern and central China. Forsythia togashii H.Hara. Japan (Shōdoshima). Forsythia viridissima Lindley. Eastern China. A genetic study does not fully match the traditionally accepted species listed above, and groups the species in four clades (Kim 1999): (1) F. suspensa; (2) F. europaea—F. giraldiana; (3) F. ovata—F. japonica—F. viridissima; and (4) F. koreana—F. mandschurica—F. saxatilis. Of the additional species, F. koreana is usually cited as a variety of F. viridissima and F. saxatilis as a variety of F. japonica (GRIN); the genetic evidence suggests they may be better treated as distinct species. Forsythia suspensa was originally introduced to Europe in 1833, under the name Syringa suspensa. Syringa is a genus in the Oleaceae family known as lilacs, but it was soon recognized that this new plant did not fit with the lilacs. 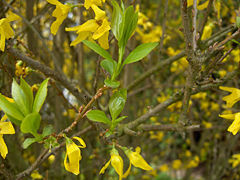 Its genus name was changed to Forsythia by Vahl, who named it in honor of William Forsyth (Mitchell 2001). Forsythia europaea is rarely grown as an ornamental plant, since it is the least ornamental of the species, but it is unique because it is found native in Albania and Kosova (Mitchell 2001). Forsythia viridissima is Chinese, but a variety koreana was discovered in 1917, by Ernest Wilson, and has slightly larger and brighter flowers. Wilson also found F. ovata in Korea. F. japonica is closely related to F. ovata, but taller, with similar solitary flowers (Mitchell 2001). In addition to the distinct species, there are a number of hybrids and at least 41 cultivars that are known (Mitchell 2001). Among the most important hybrids are Forsythia × intermedia (F. suspensa × F. viridissima) and Forsythia × variabilis (F. ovata × F. suspensa). Both of these are crosses involving Forsythia suspensa. Forsythia x intermedia is a cross between the first two introductions to British gardening, F. suspensa and F. viridissima. It is sturdy and floriferous (Mitchell 2001). In 1935, the cultivar Forsythia x intermedia "Lynwood" first appeared, as a mutation of the cultivar Forsythia x intermedia 'Spectabilis'. "Lynwood" is a larger flowered improvement over the popular plant and has become one of the most popular cultivars due to its abundance of flowers along the branches (Mitchell 2001). The flowers are larger and broader than "Spectabilis;" the petals are bright yellow; and the plant is more upright, growing from two to three meters (six to nine feet) in height. Forsythias are popular early spring flowering shrubs in gardens and parks. 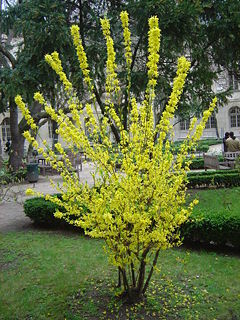 The two most commonly grown forsythias are the species Forsythia suspensa and its hybrid, Forsythia × intermedia. They are both spring flowering shrubs, with yellow flowers. They are grown and prized for being tough, reliable garden plants. 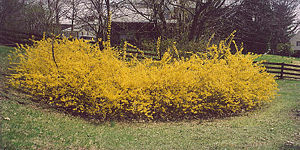 Forsythia × intermedia, the more commonly grown, is smaller, has an upright habit, and produces strongly colored flowers. It is a vigorous, sturdy plant that can be grown in a variety of soils. Forsythia suspensa, a large to very large shrub, can be grown as a weeping shrub on banks, and has paler flowers (Huxley, 1992). Forsythia x intermedia 'Lynwood' is a particularly popular cultivar, with its large, broad flowers, often in clusters of three, and with the petals bright yellow (Mitchell 2001). The shoots can be brought into the house to open and will offer a display for a week or even three while the leaves develop and roots appear; the sprouted shoots can then be planted into the soil (Mitchell 2001). F. ovata is not a vigorous plant and has small, pale yellow flowers, but it will suit small gardens (Mitchell 2001). Commercial propagation of forsythias is usually by cuttings, taken from green wood after flowering in late spring to early summer; alternatively, cuttings may be taken between November and February (Huxley 1992). F. suspensa (Chinese: 连翘; pinyin: liánqiào) also is considered one of the 50 fundamental herbs in Chinese herbology. Forsythia sticks are used to bow a Korean string instrument called ajaeng. Forsythias are used as food plants by the larvae of some Lepidoptera species including Brown-tail and The Gothic. Flora of China (FOC). n.d. Forsythia. FOC 15: 279. Retrieved May 10, 2009. Germplasm Resources Information Network (GRIN). n.d. GRIN Species Records of Forsythia. USDA, ARS, National Genetic Resources Program. Germplasm Resources Information Network. Retrieved May 10, 2008. Kim, K.-J. 1999. Molecular phylogeny of Forsythia (Oleaceae) based on chloroplast DNA variation. P. Syst. Evol 218: 113-123. Retrieved May 10, 2009. Mitchell, B. 2001 Plant of the Month (April): Forsythia x intermedia 'Lynwood'. St. Andrews Botanic Garden. Retrieved May 9, 2009. Oxford Plant Systematics and Diversity. n.e. Forsythia Vahl. University of Oxford. Retrieved May 10, 2008. Royal Botanic Garden (RBG) Edinburgh. n.d. Forsythia. Flora Europaea. Retrieved May 10, 2009. Forsythia viridissima Vanderbilt University—Forsythia page.